Do you find yourself feeling lonely or craving companionship? Have you considered purchasing a machine that could fill that void? No, not that kind of robot. I’m talking about moving, talking, thinking robots that can do things like fetch a cup of coffee and dance with you. This has been a futuristic concept for decades, and that future is finally here. It’s also for sale. There are a number of so-called companion robots now on the market, and several of them were on display at CES in Las Vegas. Some of these devices are small tabletop gadgets that essentially function like pumped-up Amazon Echos with more moving parts. Others, however, are standing, walking, humanoid robots straight out of an Isaac Asimov story. Companies have different things to say about the varying approaches. Some say that they don’t think people want a robot that looks like a robot. Others want users to interact with machines as if they were people, even though it might seem creepy at first. The most impressive humanoid robot on display was Walker by the Chinese robotics giant UBTECH. You might know UBTECH from its Lego-like Jimu robotics kits that have been on shelves at Apple Stores for the past couple of years. The company also makes a tiny, Alexa-powered humanoid robot called Lynx as well as an adorable little Stormtrooper model. But Walker is the big daddy. Standing nearly five feet tall and weighing in at 170lbs, this real-life android is the size of a human being, and it acts like one, too. I got to meet Walker at CES, where the hulking robot was performing a reasonably simple demo to show off what it could do around the house. It’s basically a robotic butler with hands that are nimble enough to open doors or pick up objects. It’s also voice-controlled, while its face is a giant touchscreen that responds to commands with cute expressions. So you can say, “Walker, get me a Diet Coke,” and Walker will walk over to the fridge, grab a Diet Coke, and then serve it to you. It works, although Walker did move around pretty slowly. The robot is also practically silent in its movements – not a trace of that cartoonish Mr. Roboto sound. UBTECH is finalising Walker’s design and says it will go on sale worldwide in 2019. The company hasn’t announced pricing, but I was it would be expensive – perhaps as much as a lower-end new car. When you consider that this machine can do anything from home control to video surveillance to security patrol to friendship, the price tag doesn’t seem too crazy. Imagining a final version that could turn Walker into a caretaker for the elderly or disabled makes the proposition even more appealing. Walker even dances. As I said, though, some companies are betting their business models on the idea that people don’t want to buy robots that look like people. That’s the basic concept behind Temi, a sort of roving tablet that was initially designed to help the elderly. The production model performs more like a telepresence robot that can also play YouTube videos. Temi will also have Alexa Built-In which means that it really can function like an Echo on wheels. What’s most impressive about Temi is how it moves around. There are 16 sensors mounted on all sides of the device so that the robot can spot and avoid obstacles as well as recognise people and faces. That means Temi can learn who you are and then follow you around your house, thanks in part to a lidar module mounted on its base. And thanks to a platform behind the touchscreen, you can have Temi deliver small objects like a smartphone or a refreshing beverage to someone else in your home. Temi does not, however, do stairs. All of these features add up to a curious companion. Temi can’t be your friend the way that Walker can because it’s essentially designed to operate more like a giant smartphone than a person. For that reason, I’m not sure how useful it will be for the average human, unless you’re someone that likes to walk and do video chats at the same time. I can, however, see Temi being great for older people who want to keep in touch with loved ones and might need help carrying small objects around the house. 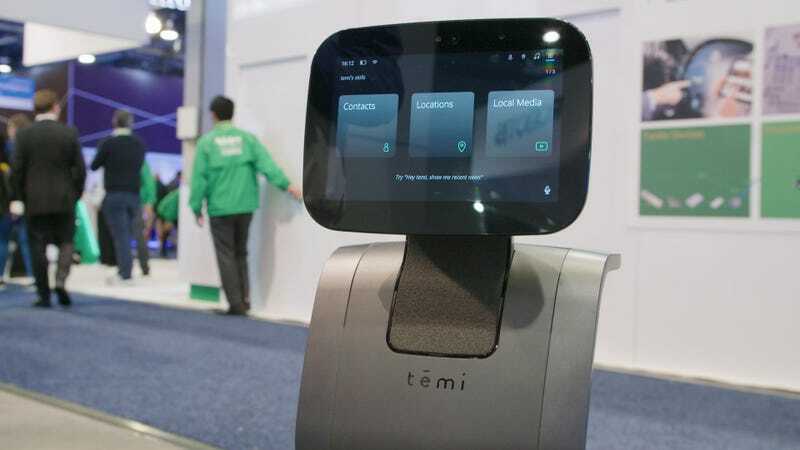 In US stores and priced at $1,500 (£1,168), Temi is attainable, too. Heck, it’s practically the same price as the big new iPhone, and the big new iPhone can’t follow you around the house. At this point, you might be spotting a common thread in these companion robots. They’re great for ageing adults. A company called Intuition Robotics is doubling down on this idea with a tabletop bot called Elli-Q, which also goes on sale this year. 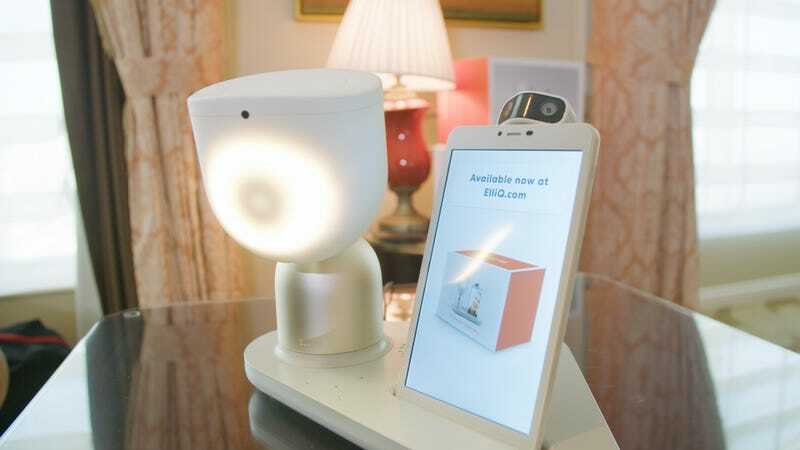 Elli-Q is designed to keep elderly people alert and engaged with the world through features like video chat, games, videos, and reminders. This device sets itself apart by being intuitive, as the company’s name suggests. Throughout the day, Elli-Q will prompt the user to do things like drink a glass of water or call a family member. It’s also supposed to sense when the user is annoyed and will stop engaging as much. Elli-Q’s design is also unique. It looks like a lamp with an LED-powered face. This body moves around much like a head would, and it is cuter than it sounds. Next to the body, there’s a removable tablet that acts as a touchscreen as well as a way to do video chats on the go. These two components are attached to a base that includes a microphone array and speakers. All together, Elli-Q is small enough to fit on a side table but big enough to be a presence in the room. As with the other robots, I tested out Elli-Q at CES and felt impressed that technology like this is finally real and on the market. I’m not the target audience for Elli-Q, though, so it’s hard for me to say if I’d really like a robot companion like it. But I could certainly see how it might be an interesting gadget for my great aunt, who is 104. She doesn’t own a cell phone and struggles with the buttons on her house phone, so a device she could set on the table and talk to might be useful. The fact that Elli-Q moves, responds, and even initiates conversations or activities seem like it could be even more transformative for folks like her. I guess that’s what intrigues me most about this new category of robots. As they become more advanced and available, personal companion robots stand a chance to transform the way we live our lives. As I talked the folks making them, many companies compared their companion robots to Rosey, the robot made known for being sassy and doing all the chores in the Jetsons household. Rosey was the subject of the very first episode of The Jetsons, which makes you think. Maybe companion robots are the first step to an ultra-futuristic future. I, for one, would like an android friend.